cause major problems such as an infection if you don’t tend to it immediately. So before you head off to far flung destinations, you have to equip yourself with items that could aid you in ensuring your wellness while on vacation. Below is a guideline on how to to prepare a first aid kit. Step 1: Determine what to include in your first aid kit. The first step is to determine what should be included in your first aid kit. Generally, this would include headache pain relievers, bandages, alcohol, and antacids. If you are going to travel with kids, make sure that you have medicines in your kit for kids. Step 2: Shop for the medications and tools for your kit. Before you go shopping, you have to make a list of what you should buy so you won’t forget a thing. You can also opt to buy a pre-packaged first aid kit. Step 3: Find a first aid bag. If you are going to assemble your own first aid kit, you may use a plastic fishing tackle box as container. You may also opt for other types of very portable boxes or bags with size suitable for the medicine and tools that you are going to bring. Make sure that you only bring the things that are necessary in order to make your kit as light as possible. Before going on a trip, you have to familiarize yourself about how to use bandages and other first aid tools. Make sure to check everything on your first aid kit before you put it inside your backpack or luggage. Organizing Medicine Cabinet – Making and organizing a first aid kit and cabinet. Having a first aid kit ready is a smart move for a person who goes into a vacation. It can make a big impact between a minor inconvenience of carrying and to a major problem. 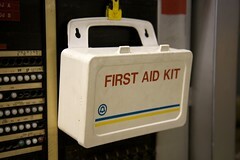 Although it is easy to just buy a ready made first aid kit, it is more easy to just make one of your own. It can save you money. Basic first aid kit to bring along in a vacation is the following: adhesive bandages, gauze rolls and pads, adhesive tape, cotton balls,scissors, hydrogen peroxide, an antibacterial cream, a hydrocortisone cream, an antihistamine, cold pack, disposable gloves, saline, elastic bandage or wrap. First Aid Kits are necessary wherever you go, especially if you plan on staying out of your house for long periods of time. They play a huge role in the safety and sanity of your family and friends. Even though you can buy Ready Made First Aid Kits off the counter, you can also make one on your own while even cutting costs, commonly first aid kits include: bandages, band-ads, scissors, creams, gloves, wrap and other medical tools and utensils you might deem necessary for your personal first aid kit. You can buy these individual items from Costco or volume stores so you can save even more money. Do not forget to have kravat or a large hankerchief on your first aid kit. You can use it in many ways like splinting, covering wounds, stopping bleeding, etc. It is advised to make it light colored (white or cream) so you can assess immediately how strong or fast the blood is oozing from the wound area. It will help if you have a small booklet of medicinal plants so that when you are out in the woods, you can easily spot plants that may help you in treating diseases or wounds. Traveling without a first aid kit is like going to a battle without a weapon. It is essential to treat a minor emergency because it could sabotage the whole trip and ruin everybody’s enjoyment. Don’t forget to include Meclizine HCI for motion sickness prevention and treatment especially when you are on a long drive or traveling by sea. Kids are mostly prone to this type of illness but there are adults also who suffer from this. So, better be safe than sorry. Traveler’s diarrhea is inevitable especially for tourists traveling to warmer countries with very poor sanitation. Eating contaminated foods such as raw food, seafood, vegetables, fruits even ice on water are almost impossible to avoid, so pack that loperamide capsules to help stop diarrhea at once.